The air is starting to get crispy and we are here for it! The leaves are changing, the days are shorter, and pumpkin Joe-Joes are back so life is good. 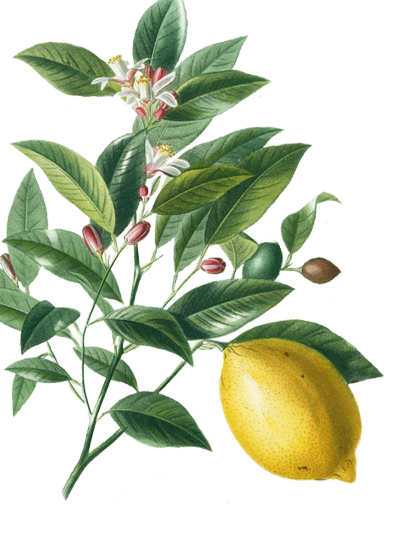 If you didn’t know, our studio is located on the fringes of a dairy farm, and though we get the occasional whiff of cow life (whiff is generous), there are a lot of lovely benefits. 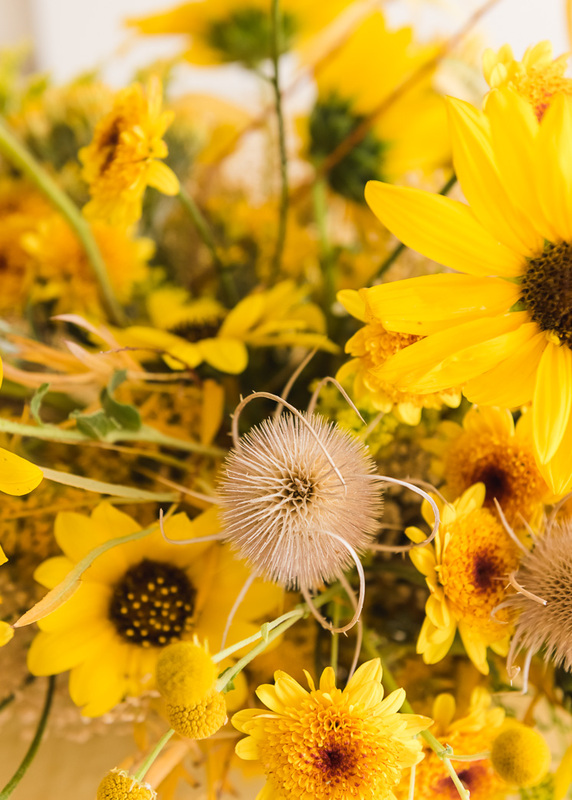 One such benefit is wild sunflowers. Right outside our window, we can see tons of golden wheat, bright sunflowers, and falling leaves. It’s heaven! Sunflowers used to be one of my favorite blooms back in the 90s’ (Hello giant sunflower hat…and on my jumpers…and dresses…and in my hair…yikes!). 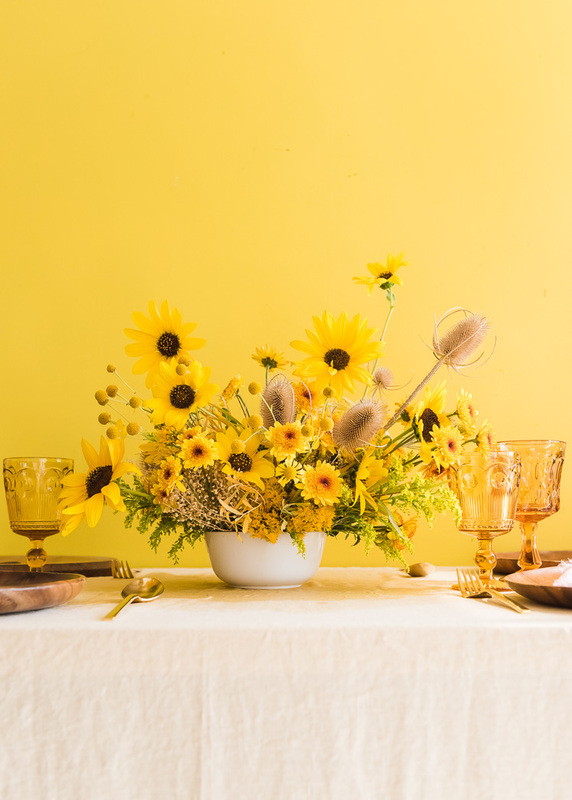 Seeing them in a pretty palette out my window had me itching to give sunflowers a refresh. 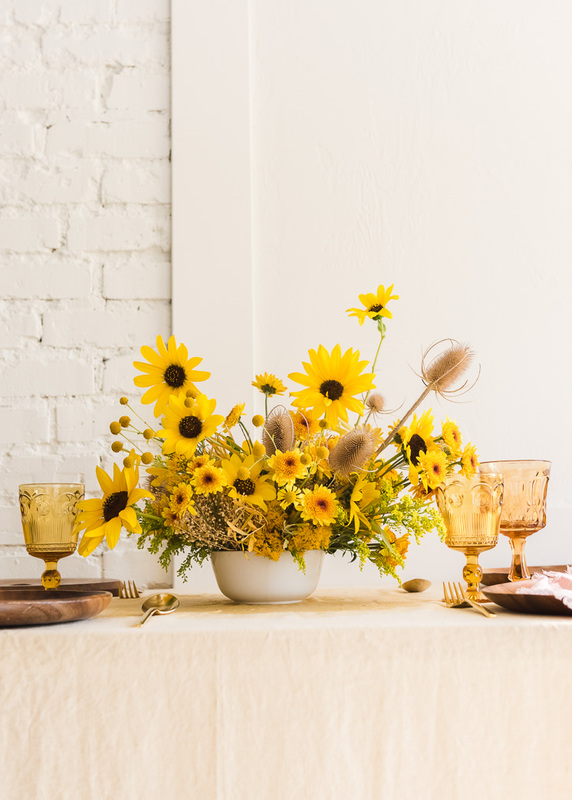 I enlisted one of our favorite local florists, Allison Badley of La Fête Floral & Design, to create a Foraged Fall Sunflower Arrangement! 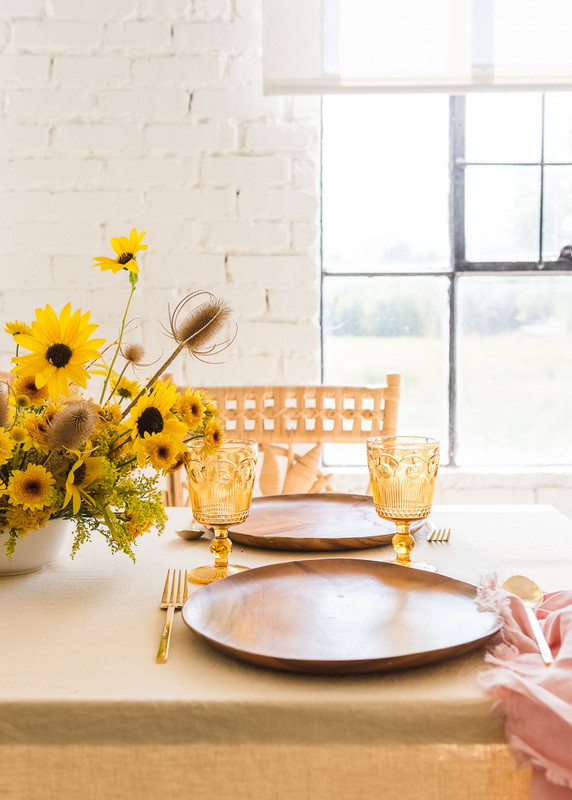 A stunning golden arrangement made from materials in your own backyard. Yes, please! 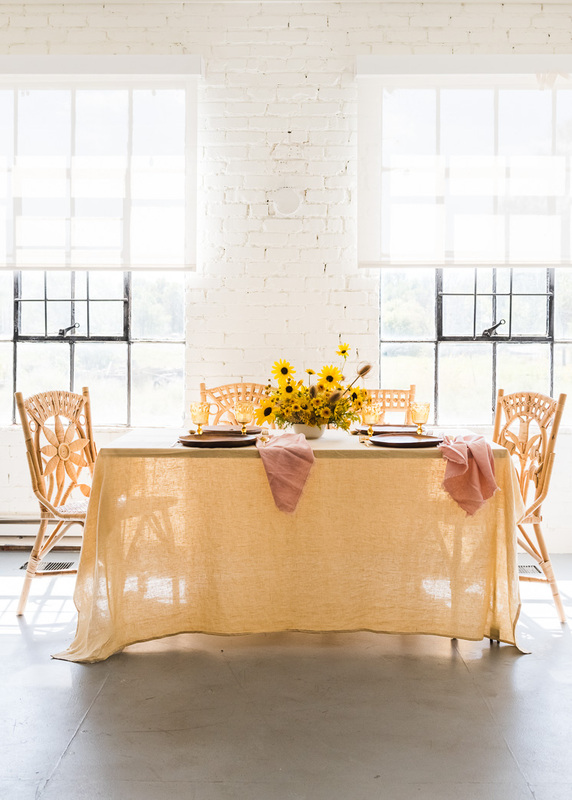 Paired with a yellow linen tablecloth, deep amber glassware, and natural wood accents, this table is a stunner and perfect for all your fall gatherings. 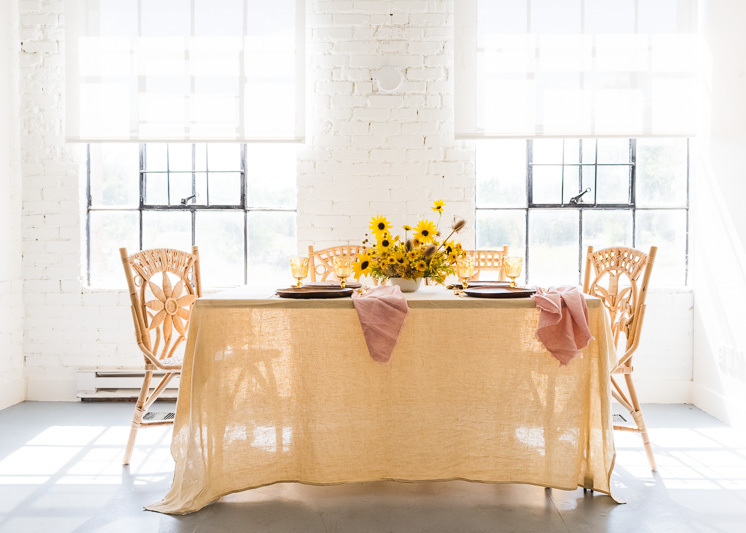 Bright, warm, and inviting, no one will want to leave the table! So take a look outside and you might be surprised to find you’ve got a lot to work with! Let’s show you how to make this golden girl! 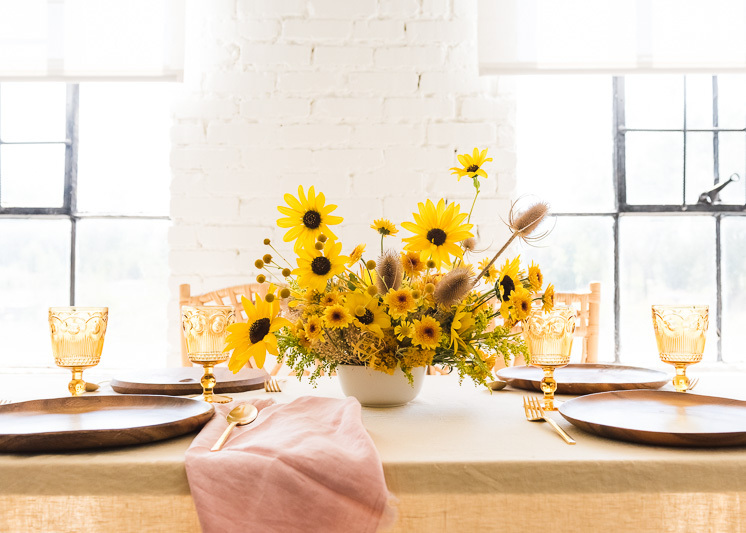 Locally foraged sunflowers, sagebrush and dried thistle. Mums, chamomile centers, golden rod bought from flower wholesaler. 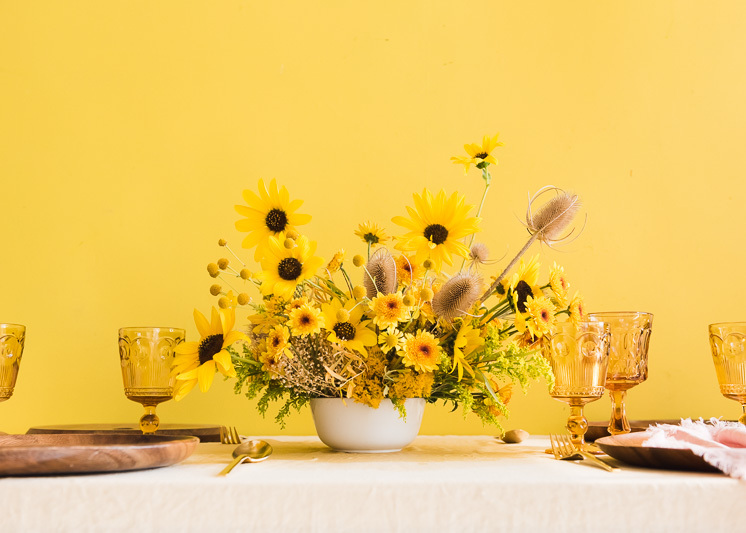 Once sunflowers are cut, try to keep them out of direct sunlight and keep plenty of water in your vessel to prevent them from drooping. Asymmetry is key! You want the arrangement to be balanced but not identical on either side. A frog in the bottom of the vessel allows you to place flowers upright and be precise about placement. 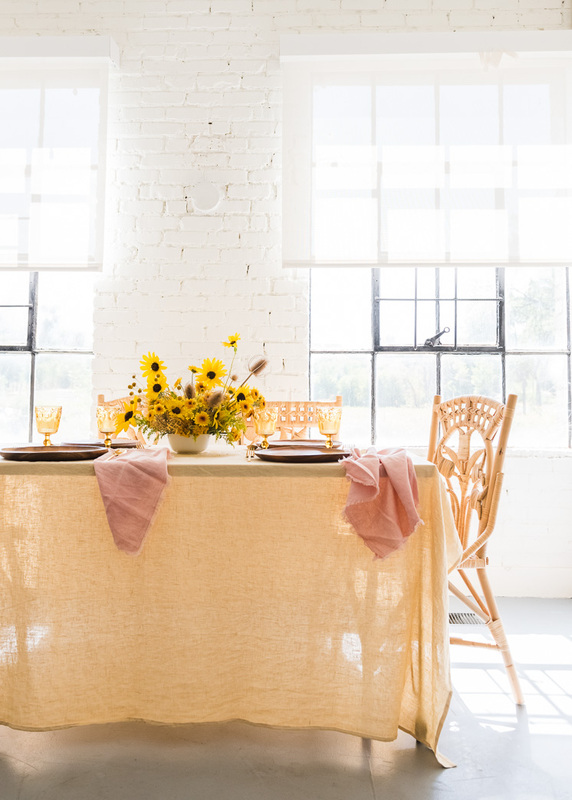 We paired our arrangement with a lovely ‘Evening Sand’ linen tablecloth from Magic Linen. 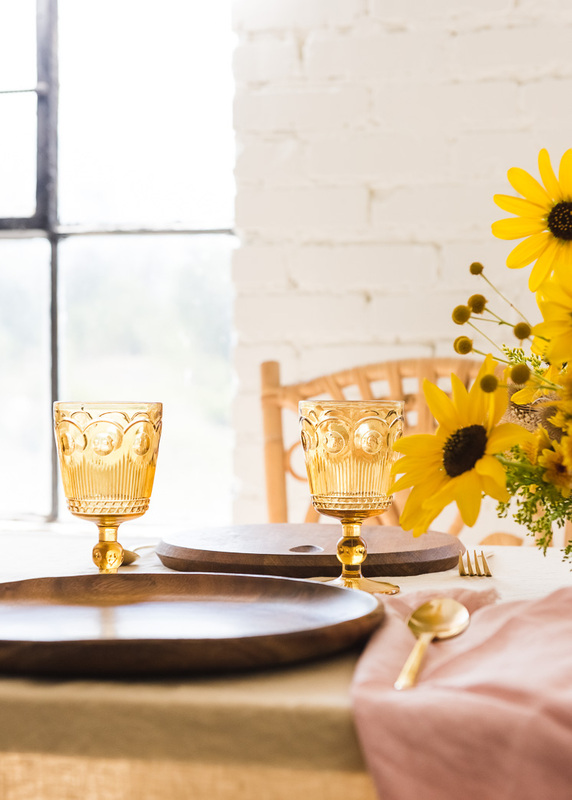 Additionally, we used golden glass goblets (similar HERE), wooden plates (similar HERE), and gold flatware (similar HERE) to send home the happy yellow vibes! where are those amazing chairs from? 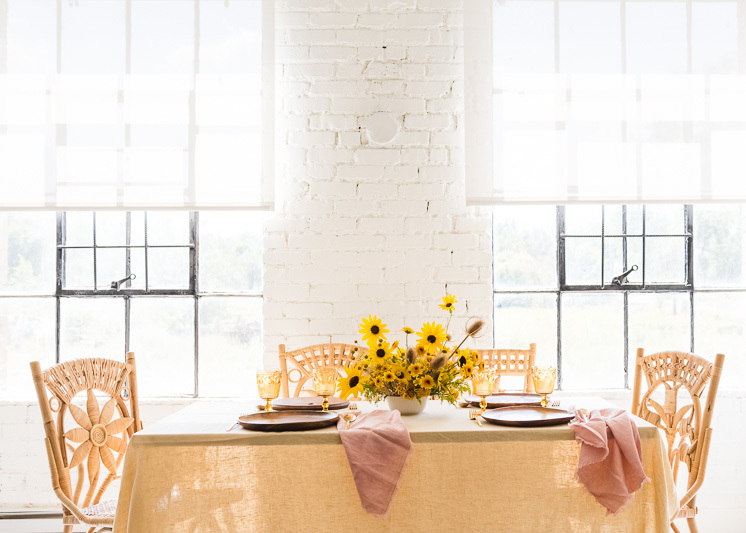 The chairs are a few years old from Anthropologie!